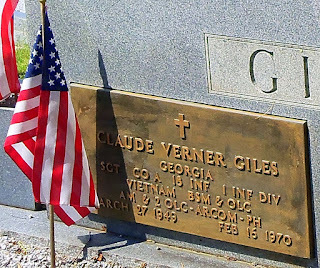 Claude Verner Giles was killed in Vietnam. A little over a month before his 21st birthday, this Clayton, Rabun County, Georgia boy was struck down likely by small arms fire. According to the Vietnam War Military Casualties database, Claude was a member of the Church of God, and he left behind a young widow. Claude's military grave marker at Taylor's Chapel Cemetery on Black Rock Mountain contains quite a few acronyms. With the help of a list created by the Nebraska Veterans Cemetery at Alliance, I was able to decipher them. Claude received (posthumously, I presume) a Bronze Star Medal & Oak Leaf Cluster, an Air Medal & 2 Oak Leaf Clusters, an Army Commendation Medal, and a Purple Heart. Thank-you, Sgt Giles, for your service.